So you’re at a arcade-bar for the first time and you’re overwhelmed by the hordes of drunken youth, flashy lights and Space Invaders sound effects. You spot a large crowd around your favorite Atari game. The bar is full, with a few salmon-shorts-clad beer drinkers sprinkled in. Where to begin? What to do first? Don’t fret: CityBeat’s got you covered on how to navigate these popular drinking-and-gaming destinations. 1. Buy a drink. 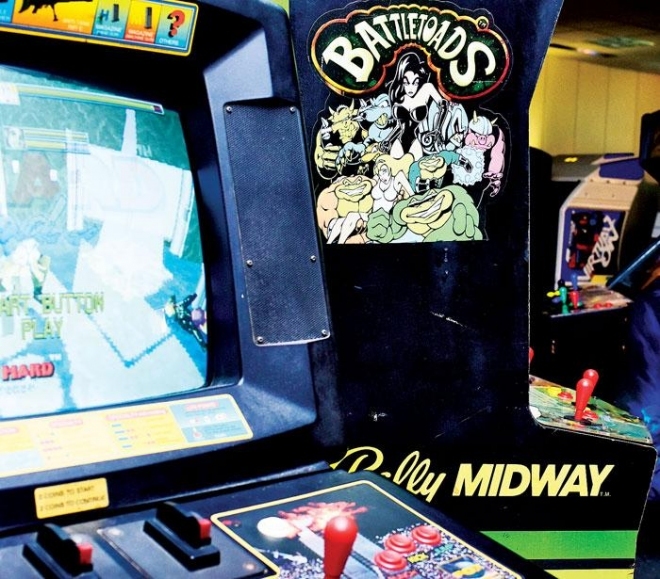 Because gaming is free at both Arcade Legacy: Bar Edition in Northside and 16-Bit Bar+Arcade in Over-the-Rhine (except for pinball at both), the only way the establishments profit is off of drink and food sales. 16-Bit only does drinks, but Arcade Legacy also serves gourmet hot dogs. Baker says it’s also totally fine to just hang out at the bar all night drinking and chowing down on veggie dogs and to not play games — the machines are just a free bonus. 2. What if you don’t drink, need to detox for the night or just want to game? Baker says he will ask guests to at least buy a soda or a bottle of water so they’re not just playing for free. Sarah Jones, the general manager for 16-Bit, agrees, saying 16-Bit has plenty of non-alcoholic options available including Abita non-alcoholic root beer on draft, fun soda flavors and a full menu of “mock-tails,” which come in a 25-oz. souvenir glass. But there’s no harm in kindly alerting someone that you would like to use the machine after they’re done. Or you can hover. As for jerks who come in to “bro it up” and just make fun of people for playing arcade games all night? Jones says that “being nerdy is totally cool right now,” so you need not worry. Overall, the most important advice she has is simple: Have fun.